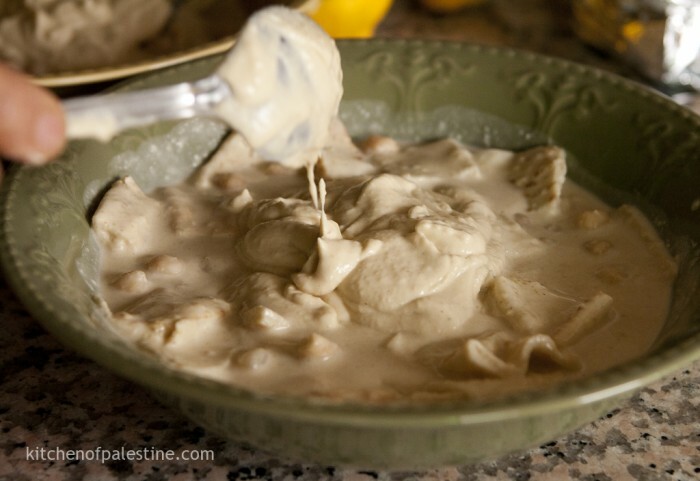 Fattet hummus is one of different fatteh dishes in the Levantine cuisine. All these dishes are based on having fried pieces of pita bread topped with different toppings… I don’t know how exactly to translate the word “fatteh” to English but I will try to explain it. 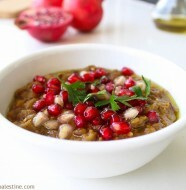 “Fatteh” is dialect Arabic word comes from the verb “fa-tta” that means to crumble bread into small pieces. It is mostly used as a name of these type of dishes. 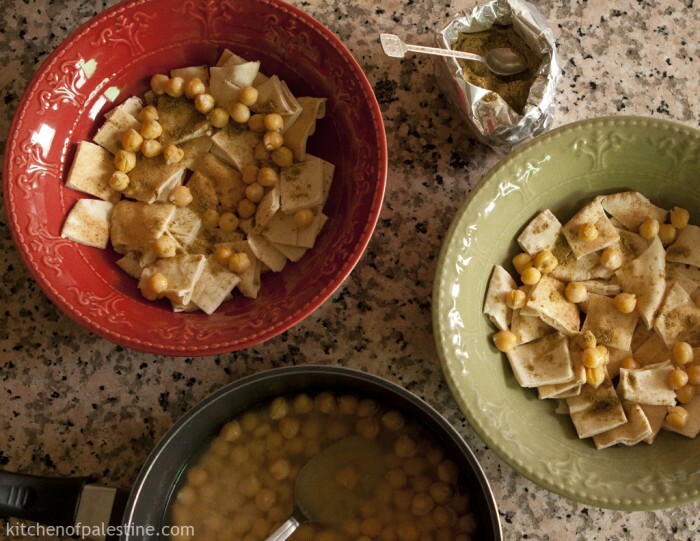 Fattet hummus (also called “tis-iyeh” as in Syria) is typically served as breakfast, mostly on Friday’s breakfasts. Also it’s served as a side dish in occasional dinners. 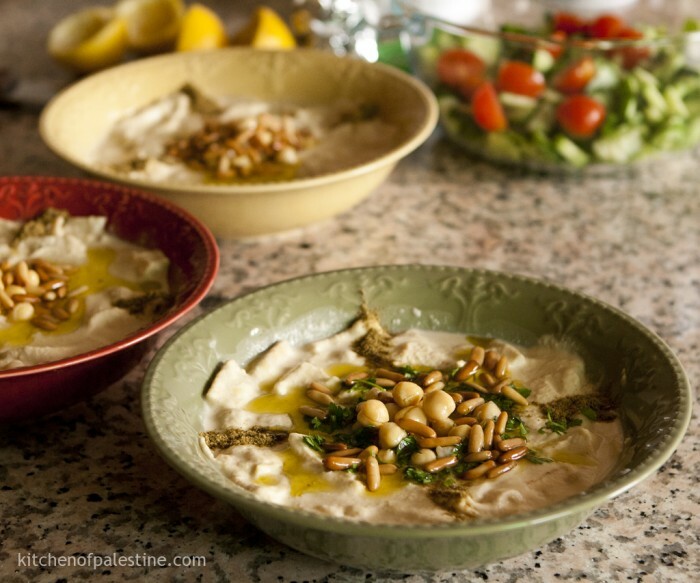 There are many recipes of fattet hummus, but I’m going to share with you the best of them all. It consists of four layers: Fried pita bread, Tahini sauce, tahini paste (hummus dip) and topping of pine nuts, olive oil, parsley and cumin. Place bread pieces in a large and deep serving dish (you may use more than one dish as I did here). 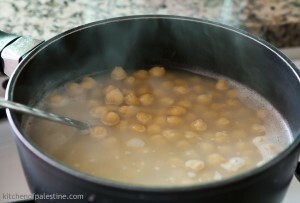 Add about 5 to 6 full tablespoon of cooked chickpeas along with some chickpea broth. Add small pinches of salt and cumin. 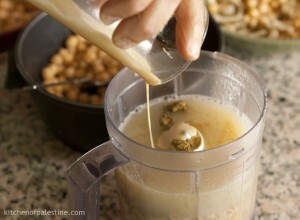 For tahini sauce: Place one cup of cooked chickpeas in a blender. 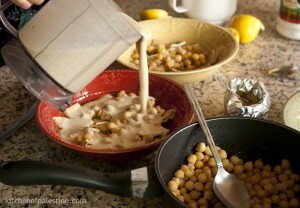 Add 1.5 cups of chickpea broth, 3/4 tablespoon cumin, salt, juice of one lemon, and 1/2 cup tahini. Blend them very well. Pour tahini sauce over fried bread. For hummus paste: Place remaining chickpeas in the same blender (leave very small amount for topping). 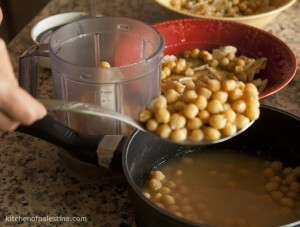 Add half cup of chickpea broth, salt, 1/4 tablespoon cumin, juice of half lemon and 1/4 cup tahini and blend. 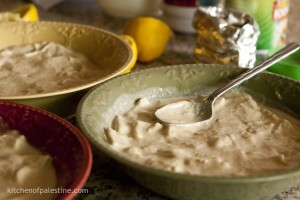 Using a spoon, add the creamy paste and spread then in the serving dish. Fry pine nuts with olive oil on a medium heat until they become golden. 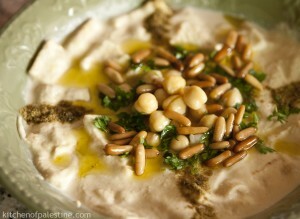 For topping: Add chickpeas, parsley, a pinch of cumin, and fried pine nuts along with olive oil. Serve hot. 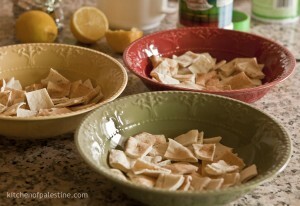 24 Comments on "Fattet Hummus"
A breakfast fit for a king! This dish looks absolutely amazing and I just can’t wait to try it. 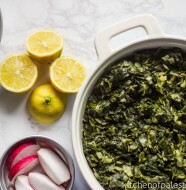 Thank you so much for sharing the recipe with so many helpful pictures. Thank you so much Svetlana :) more recipes are coming every week..
is this eaten with more bread or how? 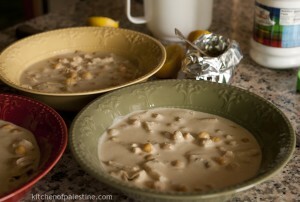 Like other fatteh dishes, it’s eaten with a spoon or a fork. If you use canned chick peas, is there enough broth? There are 2 or 3 additions of cumin and lemon juice — is this too sour? How do you heat this to serve? In the oven, the micro – or just assemble when things are warm? have their own bowl or is it a share food? Sorry for so many questions, but this is not my cuisine. I use canned chickpeas when I’m on a hurry so that should be fine. 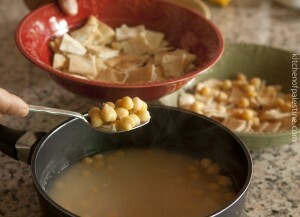 Make sure broth completely covers chickpeas, add some water if necessary. It’s preferably to be assembled on the spot when it is to be served. Quantity above serves 4 to 5 persons. And it’s not very sour, similar to hummus flavor. It’s an easy recipe and results are always guaranteed :) let me know how it goes.. I will never recommend canned food in any form, I’m Palestinian/Syrian because the sodium for one reason and I buy NON-GMO organic garbanzo beans taste completely better. I order them from Amazon. IF for lazy person to use can, you should wash the beans for hummus which you can add water if needed, but for fatteh the best is home made cooking saving the real infused water. The bread should be dry as the old days they used to break the one day old bread. Today just cut small and bake them for little bit – no frying it will be too greasy heavy. Nice pictures though. Thank you NS for your comment. I agree! Canned food should be the last option. The thing is dried chickpeas are not always available in every supermarket.. Washing canned chickpeas before using them, good tip. I’ll add it to the post. Actually this dich is made from old bread like fatoosh.People didn’t want to throw it away so they found such recipes !It was poor people food ! 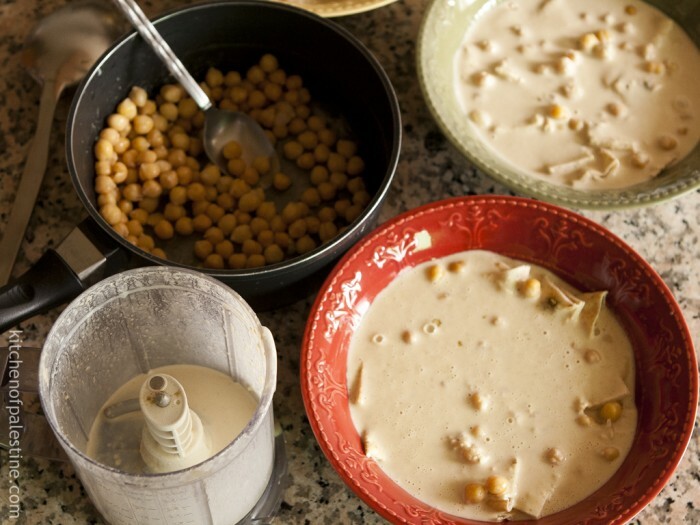 Some recipes call for yogurt in order to lighten the tahini’s flavor and texture. I don’t add it because I enjoy the rich taste of tahini, so it’s totally up to. I’ve been living in Amman for more than 15 years and I’ve never been to Hashem, can you beleive it! I don’t think that they use yogurt and they probably use sponge bread instead of fried pita bread. I’ve tried many recipes but this one beats all others ;) try it out and tell me how it goes! Thanks for the explanation! 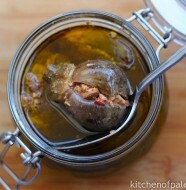 I made it last weekend just as you said (I also love the rich taste of Tahini!) and my family LOVED it!! I hadn’t tried it with the fried pita and liked it much more than with sponge bread- and I didn’t think Fattet could get any better! Just discovered your beautiful blog. Perfect recipe!!!!! Made it and it was Very yummy :-))also made the Zatar fatayer!! Also phenomenal:-). thank you for sharing and for the detailed pictures and instructions! !